Apple today announced an update to its Mac Pro line, offering up to 12 cores of processing power for up to 50% greater performance than the previous generation. The new Mac Pro also ships with new ATI Radeon HD 5770 graphics hardware, with the Radeon HD 5870 available as a build-to-order-option. "The new Mac Pro is the most powerful and configurable Mac we've ever made," said Philip Schiller, Apple's senior vice president of Worldwide Product Marketing. "With up to 12 cores, the new Mac Pro outperforms our previous top-of-the-line system by up to 50 percent, and with over a billion possible configurations, our customers can create exactly the system they want." Also available for the first time are standard display connectivity of two Mini DisplayPorts and one dual-link DVI port, as well as build-to-order options for 512 GB solid state drives (SSD). 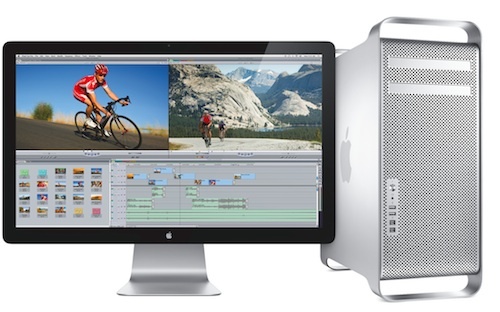 12-core options at either 2.66 GHz or 2.93 GHz push the starting price to $4999. All models are set to begin shipping in August. Looks like I'm sticking with my trusty G4 MDD windtunnel for another couple of years.